Since 1996, the academic journal Studia Europaea, published by the Faculty of European Studies, has been an open arena for promoting research endeavours. The journal is reviewed by international specialists acknowledged by the Romanian National University Research Council (CNCSIS). Senior as well as junior academics from Europe and the United States have found in Studia Europaea a way of expressing their preoccupations by publishing academic articles focusing on the European experience and perspectives in various fields of social sciences. “History, International Relations and Political Science” – welcomes articles that stress the European perspective on world politics and the analysis of European political developments. “European Economy and European Information Society” – with articles that include analyses and comments concerning the most relevant aspects of the European economy and information technology. “European Community and Business Law” – brings together articles that refer to the European states and the European Communities, their judicial and institutional organization, as well as facets of business regulation. “European Culture, Philosophy, and Anthropology” – focusing on the cross-cultural European experience, with special emphasis on relations with other cultural areas, such as Asia or the Americas. “Forum” – open for BA and MA students in the fields mentioned above. “Book Review” – welcomes critical reviews of the latest books related to the fields listed above. The call for papers is opened to young researchers, PhD students, academic staff interested to promote researches and present different perspectives on the EU. The papers should provide an analysis of economic, social, cultural and political perspectives and developments on subjects concerning the European Union. At the beginning of every academic year, the titles of the thematic issues and the guest editors will be available on the website. The Journal neither reflects nor represents any particular school or approach, nor does it restrict itself to particular methodologies or theoretical perspectives. Rather, it promotes interdisciplinarity and a greater dialogue between the various sub-disciplines of European Union analysis. The Journal is double blind peer reviewed by independent academics related to the line of study of the articles proposed. Deadlines: 15th of February, 15th of May; 15th of August; 15th of November. Synergies Roumanie est une revue francophone de la Faculté d’études européennes, appartenant au Gerflint (Groupe d’études et de recherches pour le français langue internationale) – un programme mondial d’édition et de diffusion scientifiques francophones rattaché à la Fondation Maison des Sciences de l’Homme, et dont le Siège est en France. Il crée, coordonne, publie, édite et indexe un réseau mondial de revues scientifiques respectant les standards scientifiques et éditoriaux internationaux. Il promeut consécutivement les carrières des chercheurs du monde entier ayant choisi la langue française comme moyen d’expression de leur pensée et de leurs travaux dans tous les champs des sciences humaines. Appel 2016 (prolongé jusqu’au 1er septembre! ): Télécharger ici! Biblioteca s-a constituit odată cu Facultatea de Studii Europene în anul 1995. În prezent are un fond de aproximativ 10.000 de exemplare (cărţi şi publicaţii periodice). Domeniile mari acoperite sunt: istorie, economie, integrare europeană, ştiinţe politice, ştiinţe sociale, drept, management, marketing, administraţie, eseistică, religie, cultură şi civilizaţie, antropologie etc. Biblioteca pune la dispoziţia utilizatorilor trei săli cu acces liber la raft, trei calculatoare conectate la internet şi 70 de locuri. Materialele pot fi consultate la sală, împrumutate peste noapte sau fotocopiate. Accesul se face pe bază de legitimaţie B.C.U. Biblioteca beneficiază de acces wirless. Publicatii periodice, dictionare, enciclopedii, lucrari din bibliografii (unele se regasesc doar la aceasta biblioteca). Tot fondul bibliotecii se regăseşte în Procite 5 cu excepţia publicaţiilor periodice. Observaţie: Biblioteca este deschisă sâmbăta doar în sesiune. The “John Fitzgerald Kennedy” Library of American Studies was founded in 1991. The library owns 7300 books and journals specialized in literature, history, law, political science, economy and American philosophy, as well as encyclopaedias and dictionaries. The Library of German Studies was founded in 2001, and has 5000 volumes, 30 periodicals and 140 CD-ROMs on philosophy, sociology, politics, economics, law, European Union, public administration, literature and history, as well as dictionaries, encyclopaedias and biographies. Centrul funcționează în cadrul Bibliotecii Facultății de Studii Europene și include colecții de cărți și publicații despre instituțiile și politicile Uniunii Europene. Rețeaua informatică este conectată la bazele de date ale Comisiei Europene și ale rețelei Europe Direct, facilitându-le studenților accesul la informații de actualitate, colecții de documente și materiale multimedia, utile atât în procesul de învățare, cât și în vederea pregătirii proiectelor și lucrărilor de licență, disertație și doctorat. Founded in 1997, the Publishing House of the Foundation for European Studies has as its main purpose to promote publications in the area of European studies within Babeş-Bolyai, but also publications of researchers from other universities in Romania and from abroad. 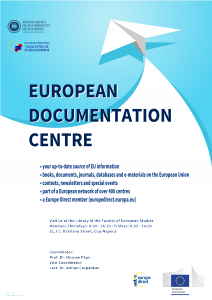 EFES publishes the following series: European Ideas and Institutions, Cultural Identities, The European Project, International Relations, Cultural Studies, EU Policies, Other Europes, European Law and Economy, American Studies, Monographies of the Folklore Archive.